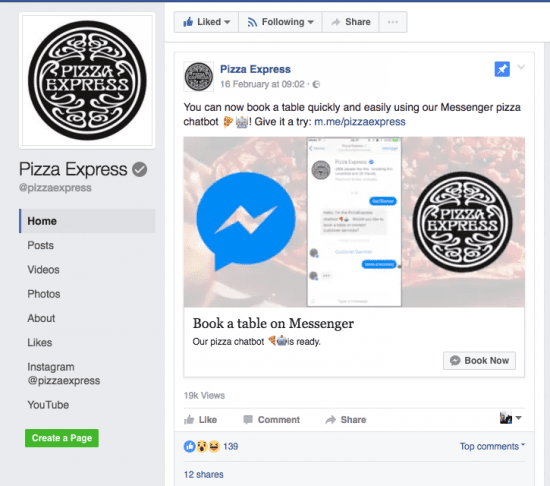 Pizza Express are embracing chatbots in their social media - how easy was it for us to book a table and what are the implications for other E-commerce sites? 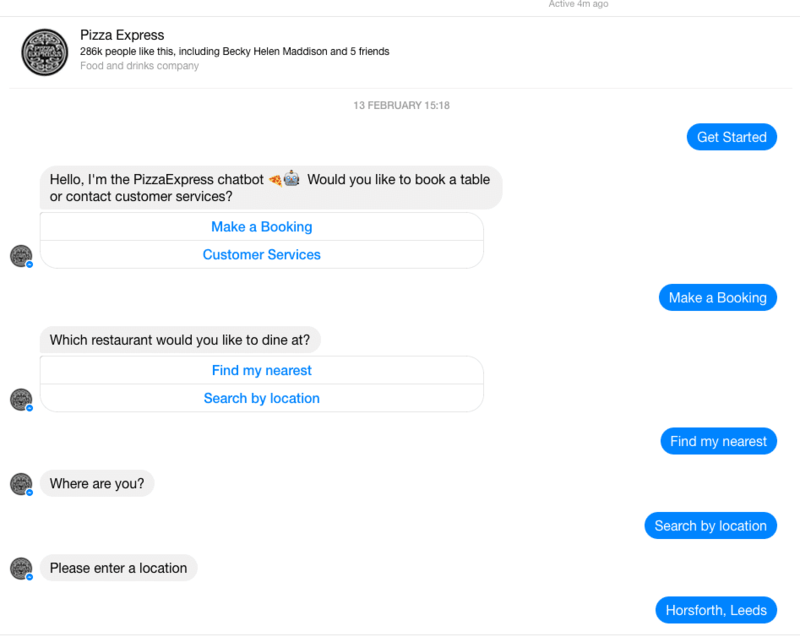 Pizza Express have launched a new chatbot on Facebook Messenger, they state it allows users to book restaurants using Messenger - we wanted to book a table ourselves, with this in mind, we did. Here's how we got on. 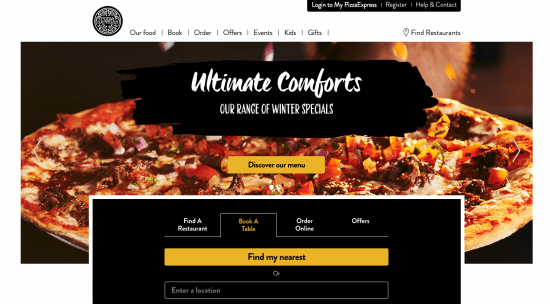 The launch followed a trial over Christmas, which was used by 150,000 people, much to the surprise of Pizza Express. We first tried it on desktop, aiming to book a table for the restaurant near our office in Leeds, UK. An interesting point to note is there is not much chat involved, you select options - I typed responses to see how well it worked, but also because I felt this was the way to do it, since it was a chat bot! On reflection, it's better to simply press the buttons, which also makes for a more mobile-friendly, finger-tapping experience. Things started off well at first. 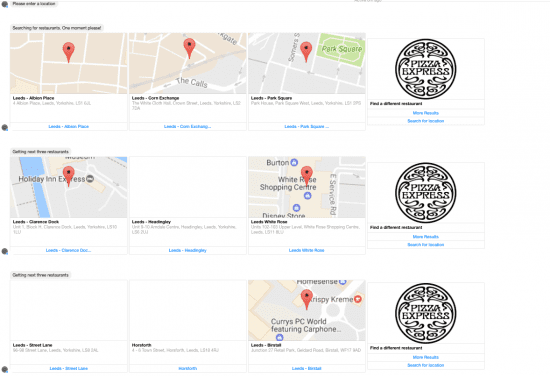 Perhaps the joy of having so many Pizza Express locations meant it was difficult to find the restaurant near us, the area name didn't work and Leeds produced so many results I had to keep asking for three more. It's quite good they offer some alternative channel links for calling the restaurant and speaking to customer services too (assuming this is what it means). What were the advantages of using the chatbot? I think it's great service for smartphones and although not measured, likely means it's quicker than using their site booking. But overall the only way to compare is to book a table using the site too. In comparison, the experience was similar (especially with having the press more buttons to show additional restaurants). The main difference was registration was required on the desktop site to make the booking. This additional step was avoided on the chatbot - the only piece of information they asked for on the chatbot was a phone number, meaning not having to type complicated email addresses. It works well for mobile, it's quick, but it's not "chatty"! It's also limited to making a booking, no special requests can be added, no questions can be asked. For example, it's not possible to ask for a menu for your chosen branch to check local prices. It also doesn't allow you to get special offers for the branch, something which you'd need to use the website for. Perhaps this is just version 1, but it's a little too simple. Some information on how to select location would be useful, there are multiple branches across Leeds, so what do I need to type? Horsforth did not work, even though the branch is called "Horsforth" on the search results. As email was never asked for and no email confirmation was sent, which did seem a little odd as this is something you'd usually get when booking online. That said the reservation number was in a Facebook message. Looking to the future - what is needed from a chatbot from other E-commerce or service businesses? 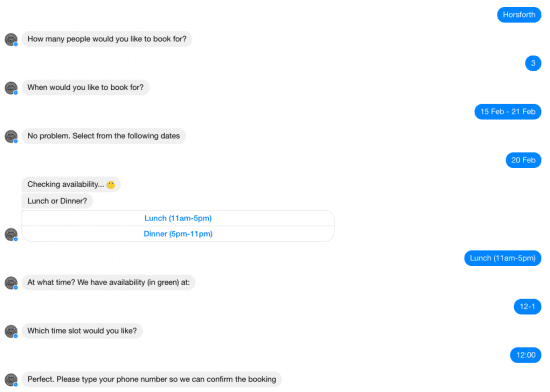 The bot works in a simple way and is valuable for Facebook Messenger users, but even so, perhaps chatbots need to be able to offer additional services or improved usability than what's available on the website, what Dave Chaffey of Smart Insights would call online value proposition. For example, with so many restaurants, customers may wish to check opening times and based on the heavily promotional marketing strategy of Pizza Express it would be helpful to see promotions for a chosen restaurant. If chatbots are saving time compared to asking questions on social media or using the website, they should mimic the actions and information. In the case of Pizza Express, checking events, ordering takeaway, booking a table, canceling or amending a booking, getting offers and seeing the menu, prices and perhaps even new menu items. What are other brands doing? Taco Bell is testing taco ordering from Slack, whilst Dominos have introduced "Dom", their Facebook Messenger Chatbot. Just Eat are experimenting with chatbots too.